The traditional, original natural red lead with high anticorrosive ability. It offers high coverage, flexibility, adhesion and great resistance to moisture. 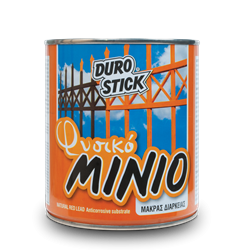 Quick drying, it offers complete protection to metals against corrosion. Necessary for the protection of metal constructs exposed to adverse weather conditions. Constructs such as outdoor railings, doors, frames and steel plates of ships. As an undercoat, it protects effectively not only the keel but also the submerged wood parts of vessels from rot. 1kg/5-8m² per coat, on properly prepared surfaces.